Stakes for the 235 piers stand in the mud and water. Sometimes a day at the "office" for a contractor can be like working in a rice patty field. Torrential rains can transform predictable, systematic work to a challenging endeavor in the midst of a mud bath. GeoConstructors, based in Purcellville, Va., has overcome these types of job sites before — many times. So it was no surprise that with some extra planning and tweaks of the work schedule, they were good to go and finished a pier project on time. "If it wasn't for the rain, it would be a perfect job site," said GeoConstructors Foreman Dan Bailey, referring to consecutive days of drenching thunderstorms and at times, steadier rain. "Yesterday, we got out of here after 10 hours. We were hoping to work 12." The job site Bailey's referring to involves his company installing a total of 236 piers over an 80,000-sq.-ft. area for what will be a four-story parking garage, part of a condominium development in Horsham, Pa., a suburban Philadelphia town. 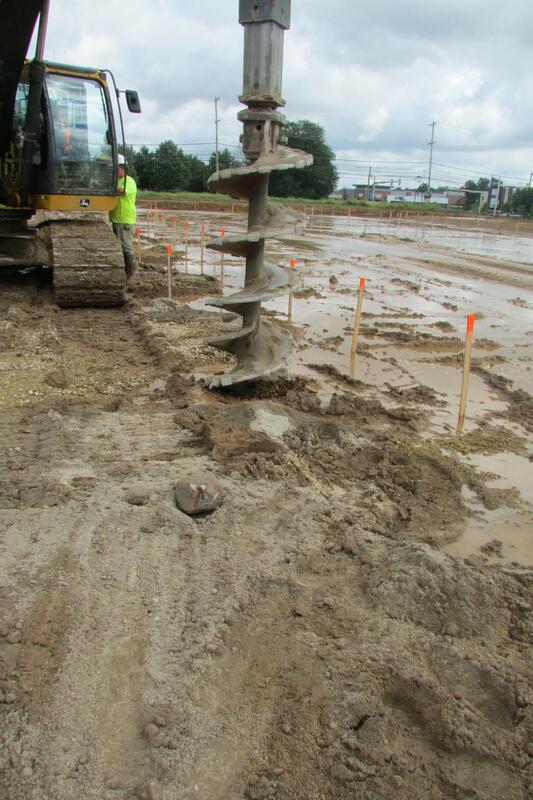 The job started Sept. 20, 2018, and involved creating rammed aggregate piers using the Geopier product for which GeoConstructors is a licensed installer. Four to five equipment operators are on site, ideally working from 6:30 a.m. to 7 p.m.
"It's pretty standard for our Geopier product," said Zach Marcum, equipment superintendent of GeoConstructors. "It's always a crushed stone that we use for the piers themselves with a ¾ in. clean stone base and that is pretty much it for us. 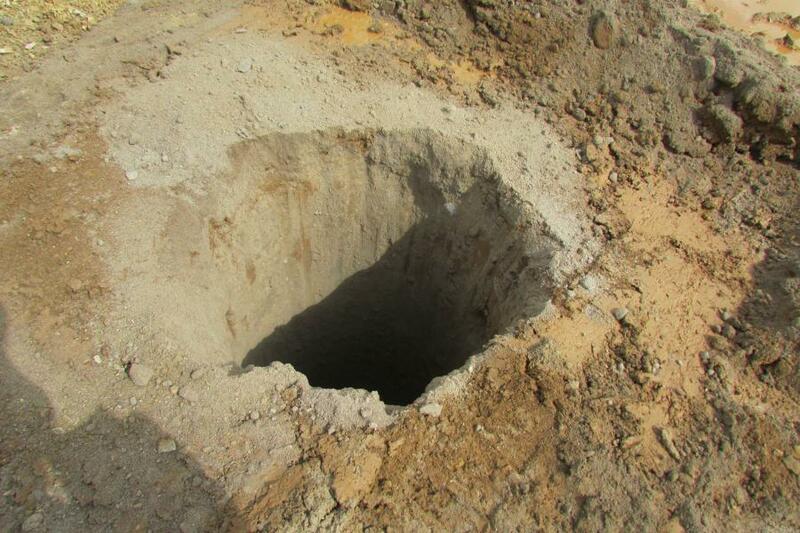 We just drill the hole to the specified depth and build the Geopier to whatever bearing surface we need to get to and then another contractor will pour the footing right on top of it." 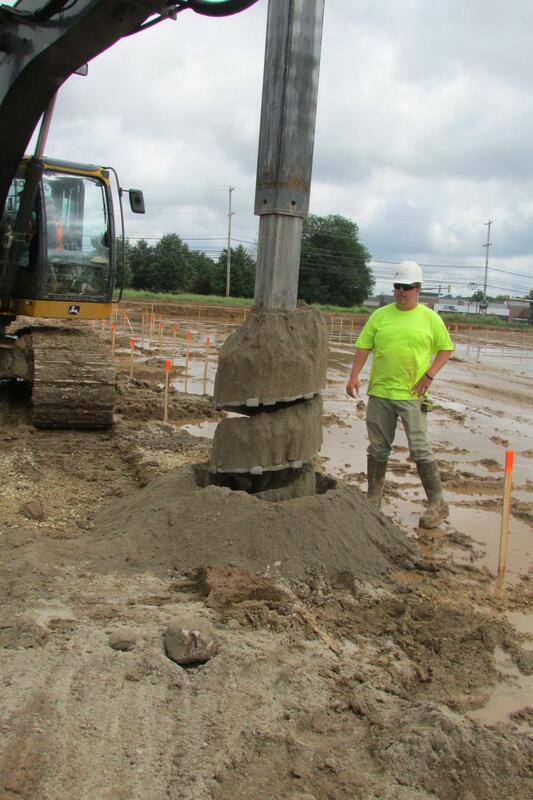 Marcum has been employed with GeoConstructors for 14 years and said his company performs sub-soil reinforcement — Geopiers, Impact Piers, Full Displacement Columns and other foundation support for buildings. Its territory is from New York to North Carolina and anywhere in between, he said. "On this job, they are relatively short shaft lengths, so you are talking approximately 10 minutes a pier, from start to finish," he said. He added that GeoConstructors has drilled anywhere from 8-ft. holes to as much as 50 ft. for some of its projects. The Geopier product was used exclusively on the project. "It's an aggregate pier," Marcum said. "We are a licensed installer of the product and there are several different kinds. 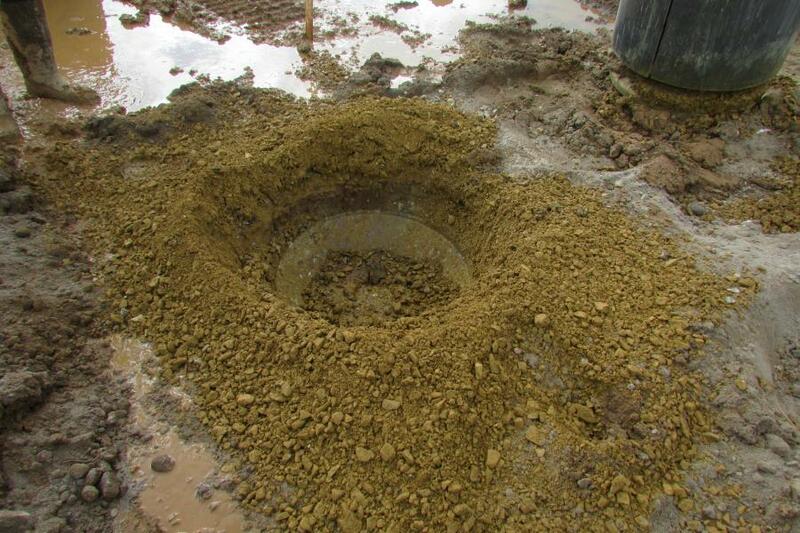 The one we are doing out here is the GP3 product, which is using a hydraulic hammer to tamp the actual stone into the ground — it's one of the methods to install these rammed aggregate piers." 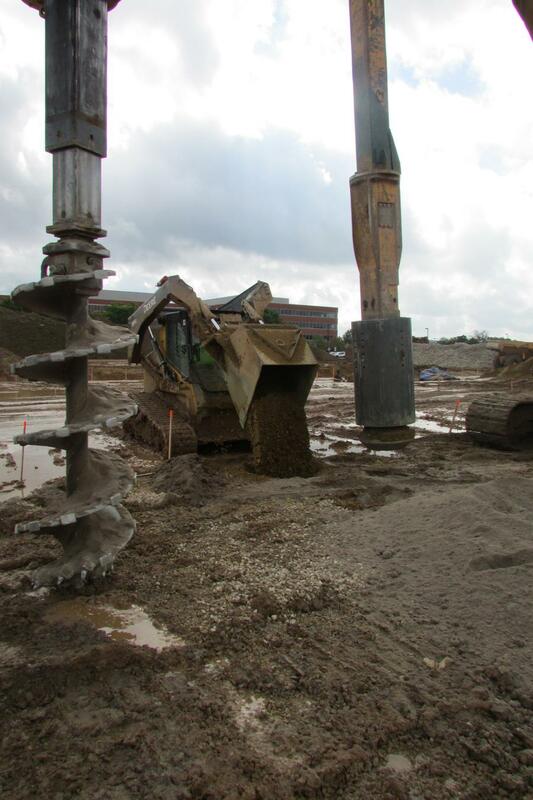 The process involves drilling the shaft to the specified depth and then pouring in the stone, tamp a lift, stone in, tamp a lift, stone in, tamp a lift all the way back up out of the ground until the Geopier element is capped on which a column foundation can be set by the concrete contractor. "We go right underneath the footing lines, so you have a footing that's 10 feet by 10 feet or whatever and we will just cover it up," Marcum said. "When we leave, you can't even tell we were there, most of the time. Then, the concrete contractor will come back in, dig his footing out and locate all of our piers, which will be all nice and pretty inside of that footer; he then starts pouring concrete right down on top of them." Marcum loves using the Geopier product. "We have been in the business a long time and we are very efficient and fast at it," he said. "It's more cost-efficient than under cut and replace, which is a pretty common thing to do or any larger scale forms of improvement. We are the nice in-between and it works out great and saves the customer money." For the project, GeoConstructors has used a Caterpillar 323 excavator with an Indeco HP4000 hammer; a Bay Shore TR30 drill on a John Deere 250G excavator and a Cat skid steer sporting a custom-made bucket to load the perfect amount of Geopier product into the drilled holes. Of course, hammers are a vital component of pier projects and Marcum said his company is aligned with a well-known name in the industry to provide service, when needed. "We work with Bobby Tedesco of Gorilla Hydraulic Breakers who provides service for all of our hammers, not just for the Indeco HP4000 hammers, but also for its Rammer E66 hammers currently being used on other projects. Gorilla's remanufacturing facility performs all of our repairs and service on these hammers for us to keep us running, no matter where we are." 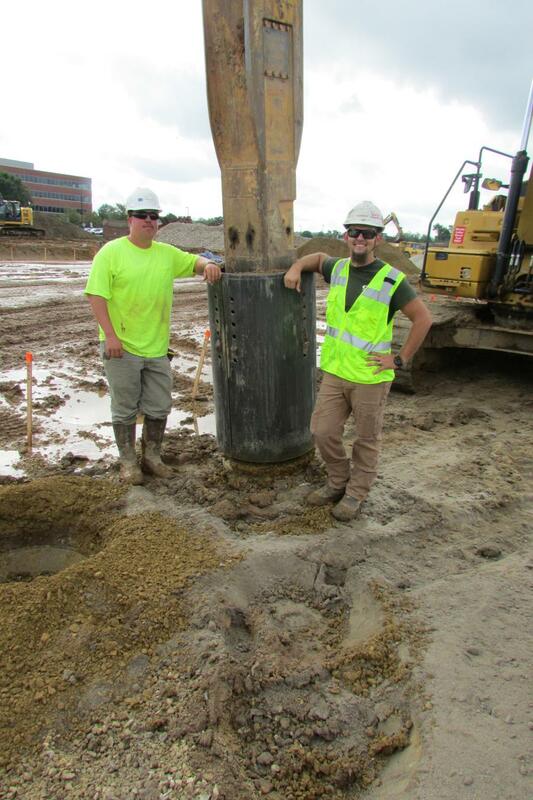 GeoConstructors has been working with Tedesco of Gorilla Hydraulic Breakers for approximately a year and a half after coming highly recommended from what Marcum calls his company's fellow licensee company, PCI-Peterson Contractors Inc., based in Iowa. "PCI does what we do in the whole Midwest from W.Va. clean over to Calif.," he said. "They have been using Gorilla for several years and he came very highly recommended from PCI and I very much respect their opinion; and they have about five times the equipment we have. "Bobby [Tedesco] knows hammers," he added. "That is the biggest thing. I have given hammers to other people that are supposed to be 'dealers' and had less than desirable results out of it and less than desirable time frames on fixes and it cost more money. Every time I've sent a hammer to Gorilla, they knew exactly what it was and usually turned it around inside of a week and was able to find parts for our older hammers. I know that when I talk to Bob that he knows what he is talking about. It's not a guess." According to Marcum, the way service works is that GeoConstructors will set up freight loads; Gorilla hammers will pay for one direction. "I set up a freight and put it on pallet and send it to their address in Massachusetts — no muss, no fuss," he said. "Then, I see it in about two weeks later all fixed up and ready to go back to work. Gorilla can do any brand of hammer and I know they service many, many hammers for other customers. Gorilla's staff is well trained and can be reached at their facility at any time from 7 a.m. to 7 p.m. Outside of that, Bob always answers his phone when I need to talk to him. This year I have already done two rebuild/replacements with them, and we're working on a fourth rebuild." Just like Gorilla Hammers and Bobby Tedesco, GeoConstructors is busy, too. At any given moment, the contractor will have multiple pier projects going on in the Northeast — and the pier work can vary dramatically. "We have done jobs that were literally 15 piers up to more than 2,000 piers." Marcum said. "The bigger the building … the more piers. We do a lot of commercial work and we've done a lot of parking garages. This is an average one for us here in Horsham. This project will start the process of building the parking garage for the homes. In total, we do about 75 to 100 projects a year." Simultaneous to the project in Horsham, GeoConstructors had work going on in Charlotte, N.C., two projects in Washington, D.C., one in Gainesville, Va. The Horsham project finished on time, the weather conditions notwithstanding. "The weather doesn't affect the process itself," said Marcum. "But it does affect the stone we are putting into these piers. There is a fine content to the stone and if it was just a wash stone it wouldn't matter, but with the fine contents that we use in this, it turns to mud when it gets wet. We have to be certain that it is dry before we use it, so we tarp it." The muddy, mucky soil conditions themselves were not a challenge. 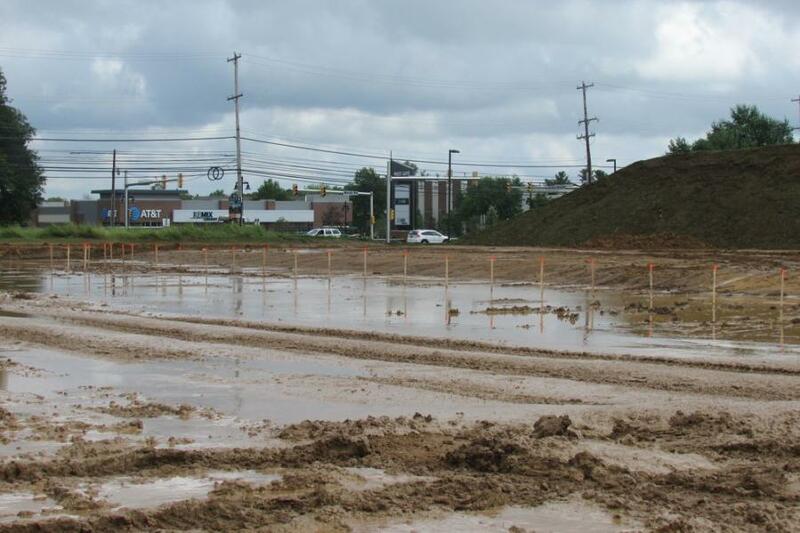 "For this particular project, it wasn't despite the rain, however," said Marcum. "It's about how we like it, actually. We are drilling down to a nice hard natural stone and it doesn't get much easier than that. Find the stone and put your pier on top of it." So, what is challenging terrain? "Trashy fills," said Marcum. "Those are always very tough. You get a lot of concrete … hard to drill through. Clays can be rough, sometimes, too." Rain or shine, scheduling is vital, like it is for any project. "When we first come in, we have to do a modulus test," said Marcum. "On almost every job, we put one of these in the ground in the worst soil conditions on site and we then load test it to see how it performs, to make sure it will meet the criteria that we designed for all of the other ones. We do it just once at the beginning at the job. We test the worst possible scenario." GeoConstructors Inc. and its engineering side, GeoStructures Inc., are based in Purcellville, Va. The company was founded in 1996 by President and CEO Mike Cowell. For more information, visit www.gorillahammers.com/ or call 888-81-GORILLA.